Lila Moonlight: "I Sure Appreciate You"
When working at Decatur Christian Towers, an affordable senior housing community, I was continually encouraged by so many of our residents. Certainly, Mr. Scroggins is to be counted among that group. Mr. and Mrs. Scroggins received Meals on Wheels and other welfare assistance. So many times shame, pride or just plain bad manners give some in their financial position a bad attitude. Or worse yet, an attitude that says that everyone owes them something. Not so with the Scroggins'. Mrs. Scroggins was bed-ridden and Mr. Scroggins took care of her. Every single day when Mr. Scroggins arrived at our office to take their meals from Meals on Wheels home, he wouldn't leave without saying, "I sure appreciate everything all of you do for us. I sure do." Unfortunately, Mr. Scroggins ended up having not one but two leg amputations in the time I knew him. Yet, never a complaint went from his lips. He got a wheelchair and used it as one would use a car. Mr. Scroggins rose early every morning to go to the grocery store for he and his wife and for others who needed anything. 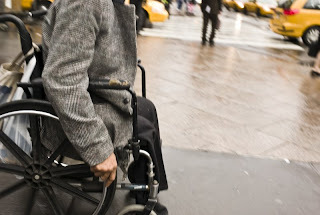 Daily he would clean the hallway outside his apartment - - all done in his wheelchair. When I learned of this daily service and thanked him, he seemed embarrassed and told me it was just a small way to partially pay back what others do for them. Mr. Scroggins could not read or write. He was unable to even sign his name with anything other than an "X". With every governmental welfare form or document, he needed assistance. Yet with any education I have been blessed to receive, this man had much to teach me by his example. His spirit of gratitude radiates in all he did. Thank you, Mr. Scroggins, for teaching us all how to really live.